A few weeks before I was to accompany Dan Johanson and the Badjao Bridge team to the Philippines last month, I received an email from Dan containing a heartbreaking story. Little Pina, a five year old Badjao girl, had slipped and fallen into the water during the night after leaving her father’s side where she slept. Little Pina always slept with her head on her father Abel’s chest. Abel felt responsible for her death as he failed to wake up when she lifted her head. Faith: faith allowed me to realize that you can’t leave someone behind that has gone on ahead. Faith that Christina is now in heaven, faith that she is happier than she has ever been in her life allowed me to overcome the overwhelming emotion that by living, I was leaving her behind. As her father, the one who was charged with her protection from the time she was placed into my arms after her birth, it was impossible not to feel a sense of personal failure at not being able to save her life. That emotion is crippling; it creates anxiety that affects breathing and causes movement to become stilted and forced. There were days I could not make it from the house to the car. With faith that Christina is a part of the future, not just a memory from the past, I was able to see Christina as a victor not a victim. It gave me an increased sense of purpose in life to realize that life here on earth is brief, that time is precious, and that all that matters is what we do to help and encourage others. Embracing faith allows me to be proactive and move forward, WITH Christina. Change: I have learned daily to reflect on change rather than how I feel. To ask how have I allowed this pain to draw me closer to Christ and be more of the person he wants me to be. Feelings and emotions will take one through a roller coaster of pain. To focus instead on change, I feel her presence as I engage in endeavors of purpose that we were both passionate about. Embracing these three principles caused me to have a purpose again, to wake up with enthusiasm instead of dread. As a result, I started focusing on endeavors that Christina was passionate about, values that were characteristic of who she was and what she represented since she was a child. First and foremost, Christina was always passionate about helping those who could not help themselves. She was like this as a child, as a student and as an adult. It is one of the reasons she was loved by all who made her acquaintance.When Christina was 18, she made a decision on her own, with her money, to sponsor an 8 year old child in India by the name of Satish. Sponsorship for most means paying a monthly amount, but for Christina, she went above and beyond and would regularly write letters to Satish and established a close relationship over the 9 year period that she was his sponsor.After Christina’s passing last year, Carol had made the call to Compassion (I was not yet able to do so) to take over sponsorship of Satish. In doing this we had the difficult task of writing him and letting him know of Christina’s passing. He was heart broken and wrote us back. In one of his letters he stated that “Christina was much more than a sponsor to him, she was like a mother.” He went on to say that “I vow one day to sponsor a child the way that Christina sponsored me.” We later received a letter from Satish’s pastor who testified to the difference that Christina, as Satish’s sponsor had made in his life. As I embraced these three principles and sought to engage in taking photographs for organizations that help “the least of these”, I reached out to Compassion International and told them the story of our family’s loss and about the impact that Christina had on Satish’s life. How one girl’s sacrificial love and boldness to listen to her heart and take action, to sponsor a child half way around the world and ultimately make a difference in his life by carrying out Christ’s command to “love your neighbor as yourself”.Before I could ask about the possibility of meeting Satish and telling his story, my contact at Compassion who was so gracious to listen and encourage stopped me and said, Ronnie, I think there is a story here, would you consider going to India and meeting Satish and telling his story. I became emotional as I felt that God was going ahead of me and opening doors as a result of months of prayer that something meaningful would come out of this tragic earthly loss. That a story could be told that would inspire others. That somehow I could continue Christina’s legacy of helping and encouraging others to help those who cannot help themselves. After months of working out details, God has opened doors that allow me to go to India and meet Satish and be a part of a story that Compassion International will publish in their summer of 2015 magazine about Christina and her passion to help others.Since then, I have reached out to numerous organizations about photographing the results of their ministry to orphans, capturing grace if you will, as a way to increase awareness of the orphan crisis and ultimately helping them gain support to be the hands and feet of Jesus. God rewarded my efforts and answered my prayers in a mighty way, connecting me with the international director of Orphan Sunday and through the work I did for them, God blessed me with divine appointments with other organizations that needed their stories told through photographs and words. These ministries are all passionate about reaching the marginalized, the afflicted and the weak, the kind of people that Jesus sat down with, broke bread and and offered a new life. I feel extremely blessed to be a part of telling the stories of these ministries.Not only will I be going to India this month but I will also be assisting orphan related ministries around the world this year in Zambia, Ethiopia, Latvia, Russia and back to the Philippines. All of this has transpired as a result of God answering prayers to use me to help others. Carol and I do not have it all figured out but we trust a God who does.As I sat before Abel, Paysa and Abel Jr., in their little house on stilts over the water on Panglau island in the Philippines, I wept with them as they told me of their loss. They described feelings that I could certainly relate to, and they asked me several questions. One of their questions was; will the pain go away, the pain that caused poor Paysa to climb to her roof and contemplate taking her own life, the pain that keeps Abel from going back to work. I told them that I wish I could tell them that the pain goes away, that time heals all things but that is simply not true. Instead I shared that in my experience, and from the experience of those whom I have talked with at length, the pain does not stop. You learn to live with it. I call it starting a new life. You learn to live this new life and you learn to accept this pain that cannot be “fixed” or made better. I let them know that they hurt so much because they loved little Pina so much, I encouraged them to work on associating the pain with love. You can’t have one without the other. To work towards letting that pain remind them of the intensity of the love they have for their precious daughter. The importance of realizing that it’s ok to hurt, it’s ok to feel really really bad. The pain is bad enough without the added anxiety of thinking you should work at fixing the pain. To shut out the pain is to also end the relationship with the one that you lost here on earth.Most importantly, I had the privilege to just listen to their stories about their little girl that they loved and continue to love so very much. To assure them that they are not alone in their pain, that I share their loss and their grief and that we walk this path together. In the early stages of grief, that is about all that one can process. It does not remove the pain but it makes it a little more manageable, sharing the load with another.I was blessed to offer them hope, to encourage them to focus on the things that little Pina loved and was passionate about; that by doing this, the relationship continues and her story lives on. My life has been blessed by getting to know these kind and compassionate people in the Philippines. The Badjao Tribe number around 1500 on Panglao Island where the Badjao Bridge ministry has it’s base. 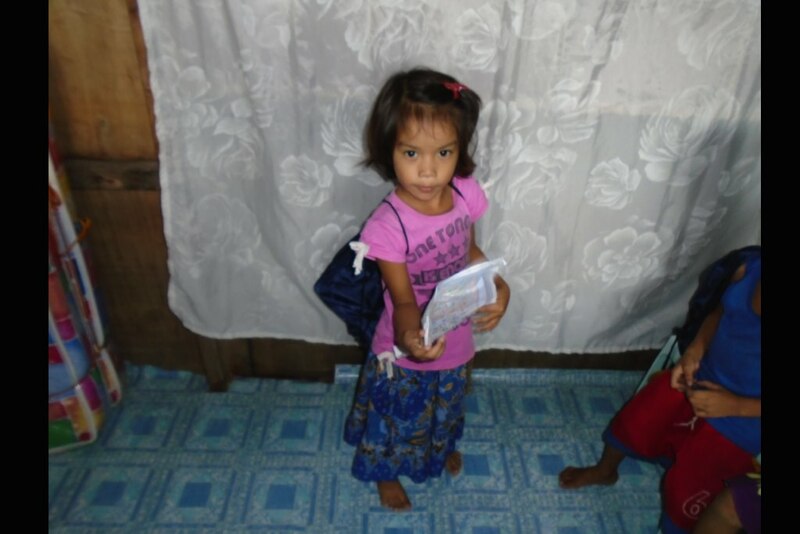 I have been blessed to participate in their ministry through child sponsorship and I invite you to read more about how you can walk beside our brothers and sisters on Panglao Island and be the hands and feet of Jesus to the least of these. The lifestyle of the Bajao leaves them very exposed to the elements, their lives are threatened by the typhoons that frequent the islands. Badjao Bridge has initiated The Lighthouse Project that will provide a safe haven. Please pray for God to direct you in participating in it’s development. Beautiful, Ronnie. Grateful to read of all The Lord Jesus has done in your life. Thank you Deborah, blessed to have friends like you to share the journey with.